Space shuttle Endeavour stands poised for a Feb. 2010 launch toward the International Space Station. The shuttle's Feb. 7 launch attempt was thwarted by low clouds. 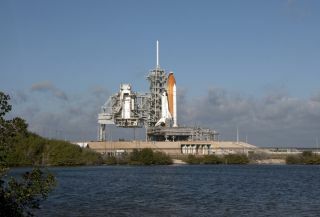 It is now set to blast off on the STS-130 mission on Feb. 8. Thisstory was updated at 10:07 p.m. ET. CAPECANAVERAL, Fla. ? NASA has fueled the space shuttle Endeavour for a plannedpredawn launch on Monday after a one-day delay due to thick clouds. Endeavourand a crew of six astronautsare slated to blast off before dawn at 4:14 a.m. EST (0914 GMT) to deliver abrand-new room and observation deck to the International Space Station. Thick,low-lying clouds over Endeavour?s seaside launch pad here at the Kennedy SpaceCenter violated NASA?s visibility rules for a shuttleblastoff early Sunday, thwarting the attempted liftoff. ?Wehope the weather?s a little bit better,? NASA launch director Mike Leinbachtold Endeavour?s crew after scrubbing Sunday?s launch try. NASAneeds good visibility over the launch pad during a shuttle launch, as well asover a nearby runway in case of an anomaly that would force an emergencylanding, mission managers said. ?Disappointedby the scrub, but got a really good night's sleep,? Endeavour astronaut NickPatrick posted on his Twitter page. He is posting updates on his upcomingspaceflight as Astro_Nicholas. Endeavourhas a 60 percent chance of good weather for Monday?s launch attempt, withfueling of the shuttle?s 15-story external tank beginning at 6:50 p.m. EST(2350 GMT) tonight. That?sjust after the scheduled kickoff of tonight?s SuperBowl 44 showdown between the Indianapolis Colts and New Orleans Saints inSouth Florida. Leinbach has said that unlike NASA?s shuttle fleet ? which isdue to retire later this year ? the Super Bowl?s days aren?t numbered, so hislaunch team can skip this one. Endeavour?supcoming STS-130 mission is the first of NASA?s five final shuttle flightsbefore the orbiter fleet is retired this fall. Commandedby veteran shuttle astronaut George Zamka, Endeavour?s five-man, one-woman crewplans to fly a 13-day mission to deliver the last major NASA segment of thespace station. Endeavouris hauling a new room called Tranquility and a seven-window observation deckthat promises to give station astronauts their best view yet of the Earth andspace. Tranquilityis a cylindrical module designed to hold the space station?s life support,exercise and robotic arm control systems. Three spacewalks are planned toattach the new space room. Theobservation deck, called the Cupola, is a dome-shaped portal that will bemounted to an Earth-facing berth on that new module. It includes six windowsarranged around a large, round central portal that is the biggest window everbuilt for a spacecraft. Setto launch on Endeavour with Zamka and Patrick are shuttle pilot Terry Virtsand mission specialists Robert Behnken, Kathryn Hire and Stephen Robinson.All are spaceflight veterans except Virts, who is making his first trip tospace on the mission. Endeavour?slaunch comes on the heels of an order from President Barack Obama that NASAscrap its Constellation program responsible for building the Orion spaceshipsand Ares rockets that were slated to replace the retiring shuttle fleet andhelp return astronauts to the moon. PresidentObama issued the order last week as part of his 2011 budget request for NASA,which would cut the Constellation program, extend the space station?s usethrough 2020 and set aside funding to support the development of commercialspacecraft for launching astronauts into space. Insteadof building new spaceships, NASA would use that funding to develop new technologiesand capabilities to push human spaceflight beyond Earth orbit, possibly to themoon, asteroids or Mars. The budget request still has to be approved by membersof Congress, some of whom have already spoken out against the newNASA direction, before being approved. OnSaturday, NASA administrator and former astronaut Charles Bolden told reportersthat he believed commercial spacecraft builders may be able provide access tospace faster and cheaper than the space agency?s Constellation plan. Healso stressed that NASA is not throwing out everything it developed under theConstellation program, on which it spent five years and $9 billion. The agencyis taking a close look to see what things can be saved for the future. ?Whilewe are phasing out the Constellation program per se, I don?t want to throw outthe baby with the bathwater,? Bolden said. NASAand White House officials have not set firm target destinations for futurehuman spaceflight or any deadlines to reach them, but Bolden said the focusright now is developing the capabilities required to open up the solar system.The destinations will come later. ?We?vegot to settle on an ultimate destination,? Bolden said. ?I think they should bemoon, Mars, asteroids.? Endeavour?slaunch will mark NASA?s first shuttle flight of the year and the 130th orbiterlaunch since the fleet began flying in 1981. NASAwants to launch the shuttle Monday in order to clear the way for the plannedFeb. 10 launch of the new Solar Dynamics Observatory. Thesun-watching probe?s liftoff has already been pushed back a day due toEndeavour?s launch delay. It is slated to blast off atop an unmanned Atlas 5rocket from the Cape Canaveral Air Force Station near NASA?s Kennedy SpaceCenter. SPACE.comis providing complete coverage of Endeavour's STS-130 mission to theInternational Space Station with Managing Editor Tariq Malik in Cape Canaveraland Staff Writer Clara Moskowitz in New York. Click here for shuttlemission updates and a link to NASA TV. Live coverage begins at 11 p.m. ET.